Projects I’m currently working on appear below. More photos are added as each progresses. Completed projects get moved off this page and into the Build Diaries. 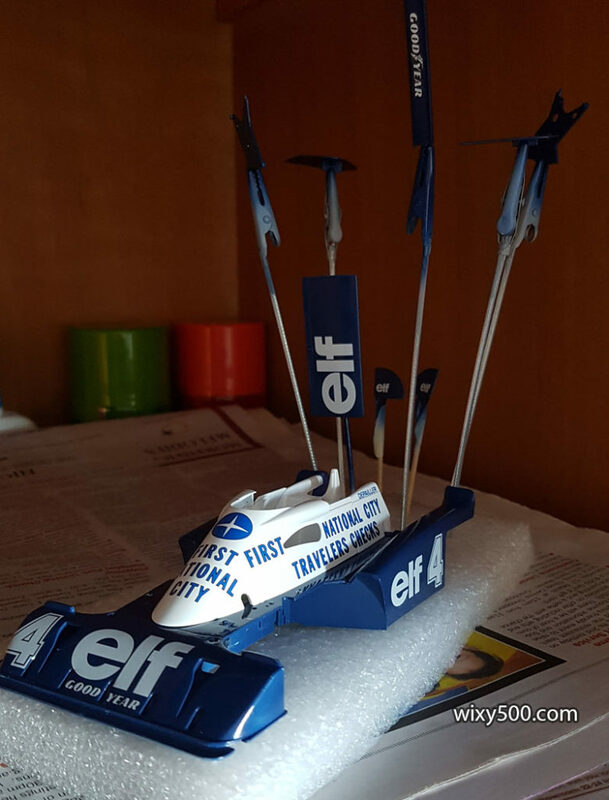 I was very tempted to do a “modern day” F1 kit next, such as Tamiya’s Red Bull, but decided to do this Tyrrell instead. Many (many!) years ago I already built Tamiya’s first issue of this 1:20 scale 6-wheeler, the navy blue P34 from 1976. 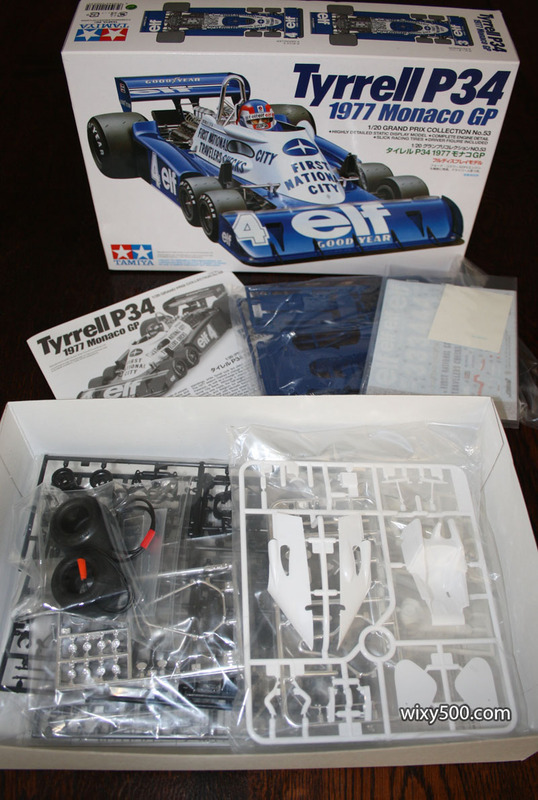 For 1977, Team Tyrrell used the P34/2, a modified version of the original P34 that featured a wider front track and very different bodywork. 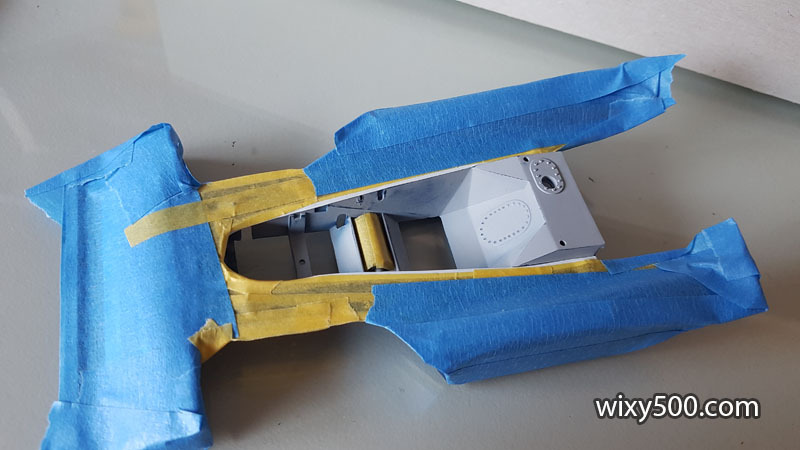 However, for the Monaco and Belgian Grands Prix the team reverted to the 1976-spec bodywork. And that’s what this kit depicts. 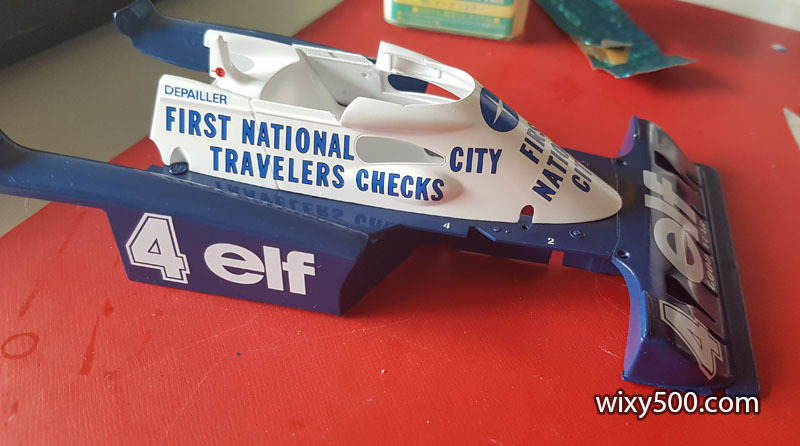 No 53 in the 1/20 Grand Prix Collection, this later version appears to have all the same components as the original, plus several extra parts specific for this race. Box content. 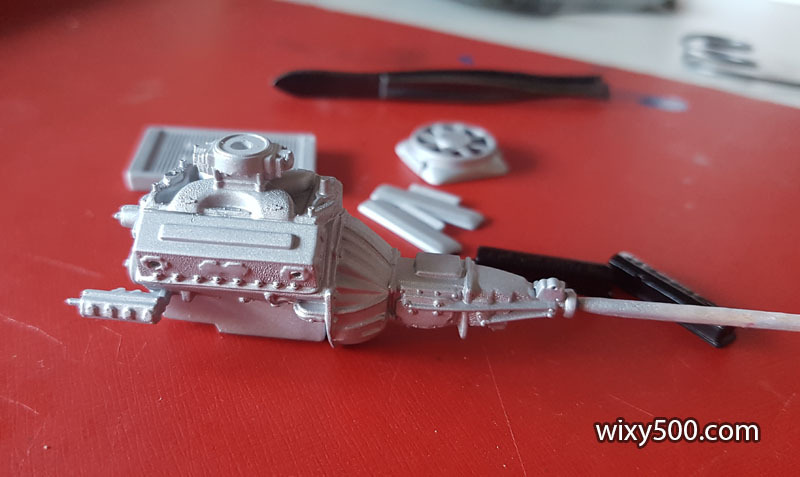 Quite a few extra parts in this compared to the original. 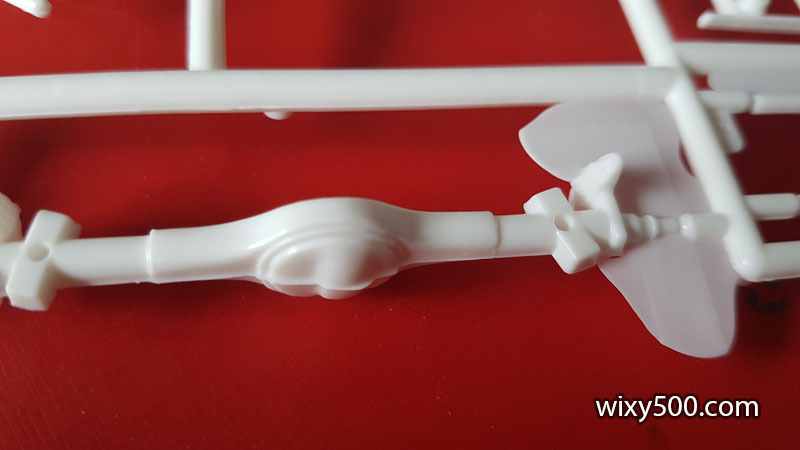 The cockpit surround is molded in two white pieces. 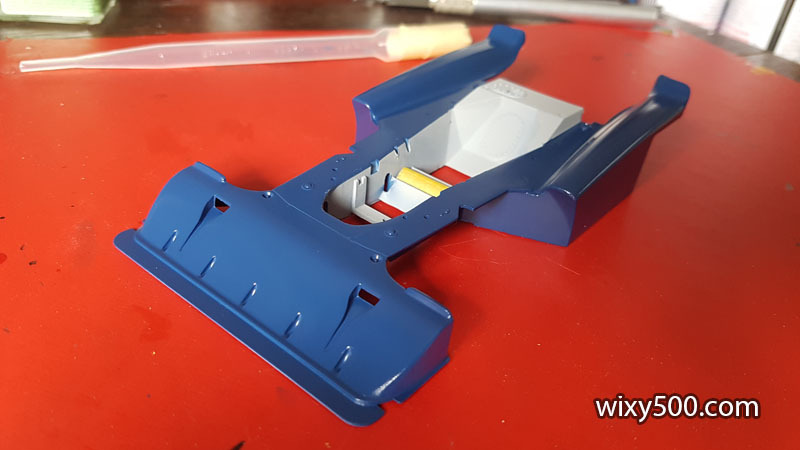 Rather than use the part supplied by Tamiya (the blue bar in the pic) to set the spacing, I just used the chassis and seat insert as it’s those parts the cockpit has to fit against. 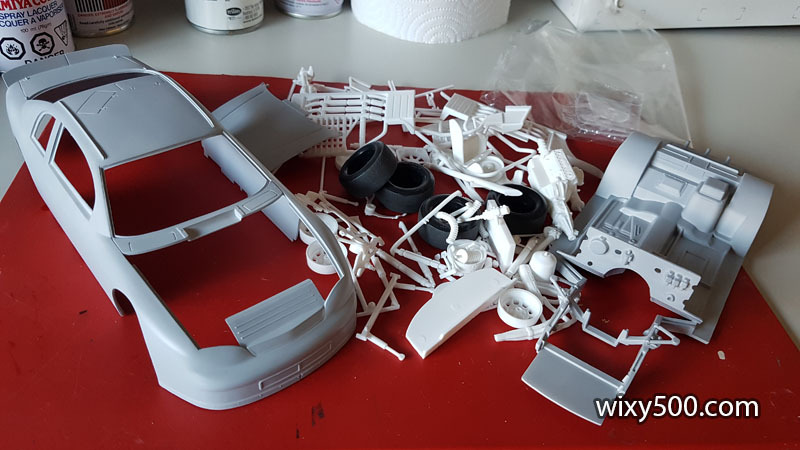 Box of parts – all components cut, trimmed and (where needed) filled with putty, ready for paint. Aluminium colour for the tub and engine bock. Looks very bland straight out of the airbrush. Things have been moved around in my office/study/studio resulting in the model work area being relocated. 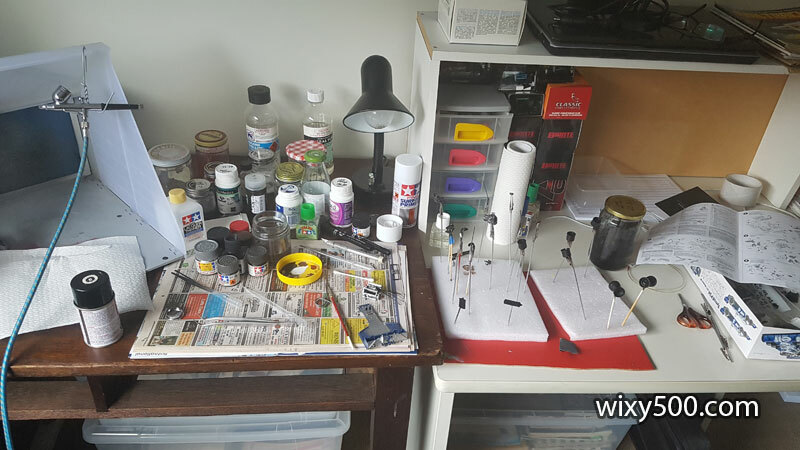 Very messy until I get some time to be more organised. 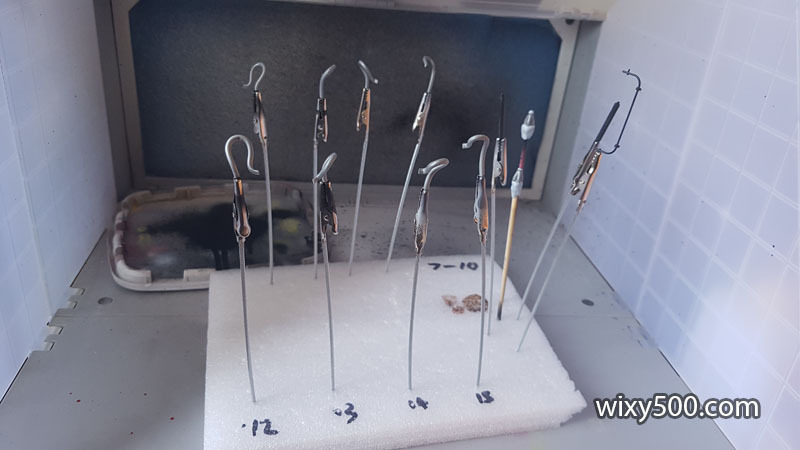 While most Aussies spent the day watching the AFL Grand Final, I got these components done! 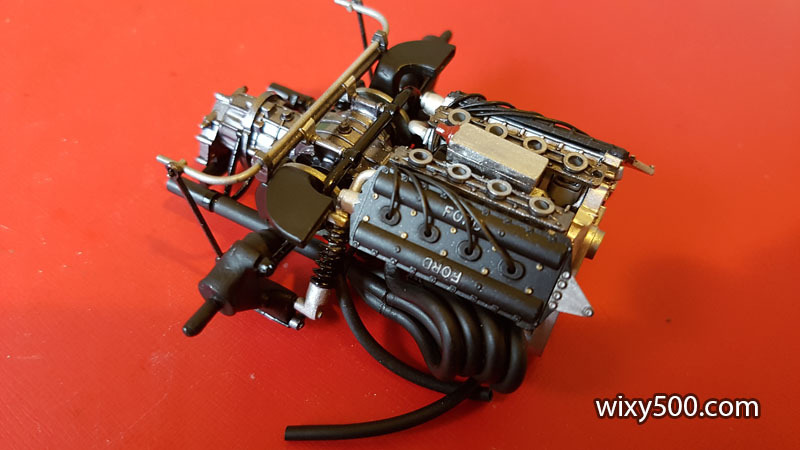 Ford Cosworth DFV block, awaiting exhaust and injection trumpets. There’s still some work to be done on the rocker covers before the plug wires get inserted. 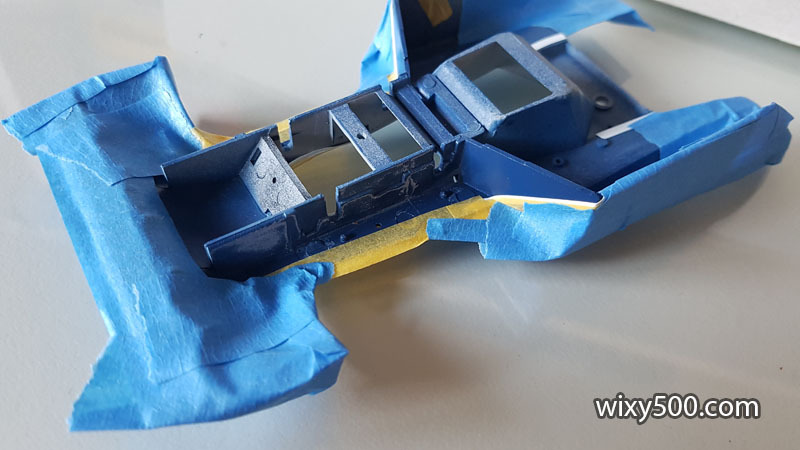 After another light coat of primer, the cockpit is masked off ready for the first coats of blue on the main body. 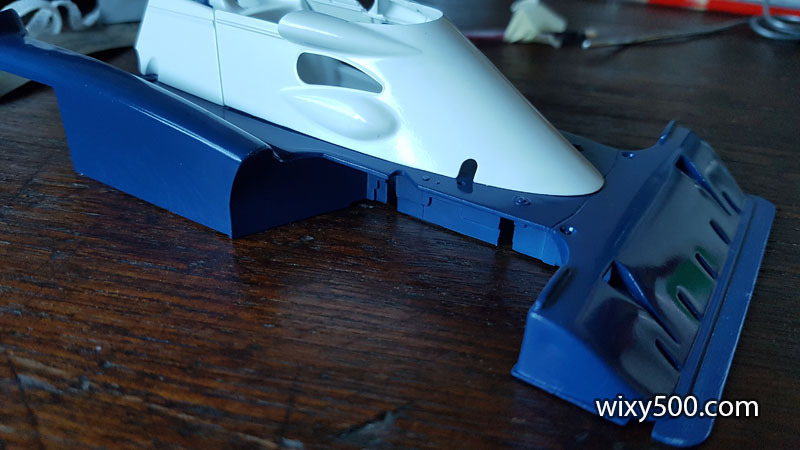 Body is now blue (Tamiya TS-15), but I’m not happy with it (orange peel, low shine). Will try some polish before deciding whether to continue, or strip and start again. 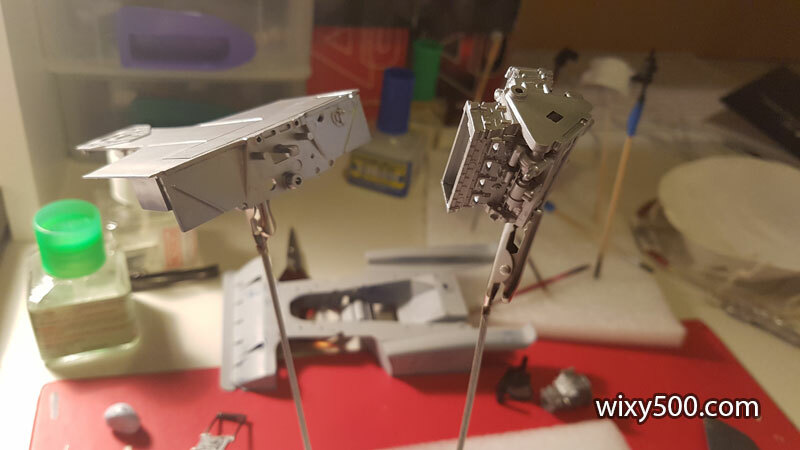 Applying decals. 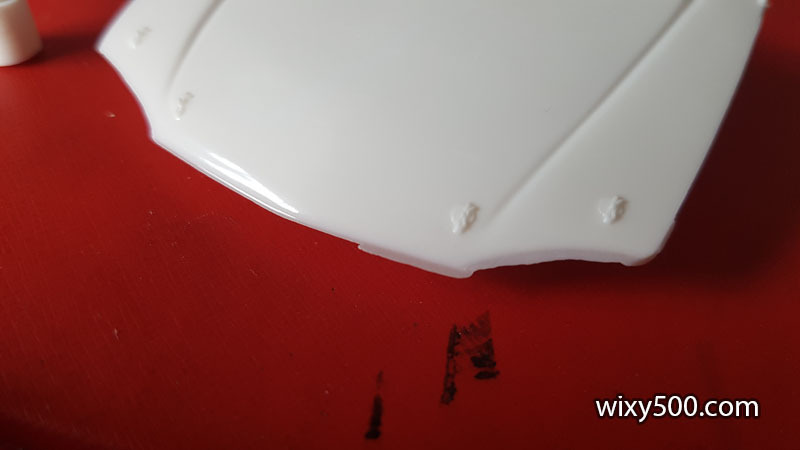 The ‘National’ and ‘Travelers’ decals span two pieces of bodywork and require the decal to be cut (after applying) so the cockpit surround can be removed. Decals drying for a couple of days before clear coat. 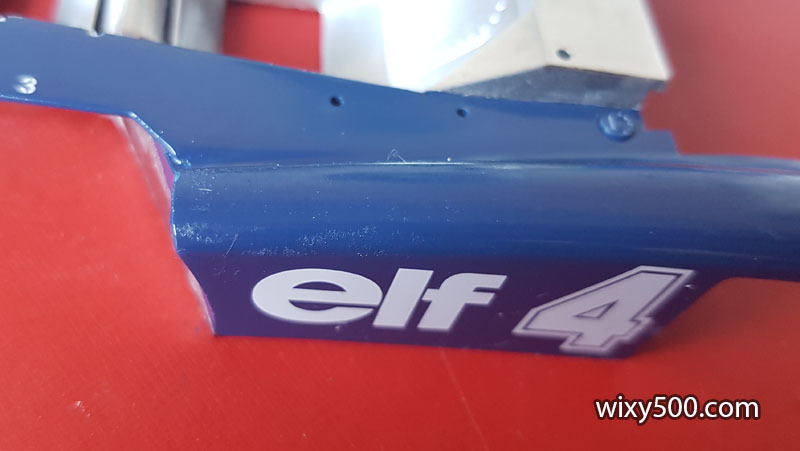 Not perfect, but if I can replicate the finish of this piece on the rest of the bodywork, I’ll be a very happy chappy! 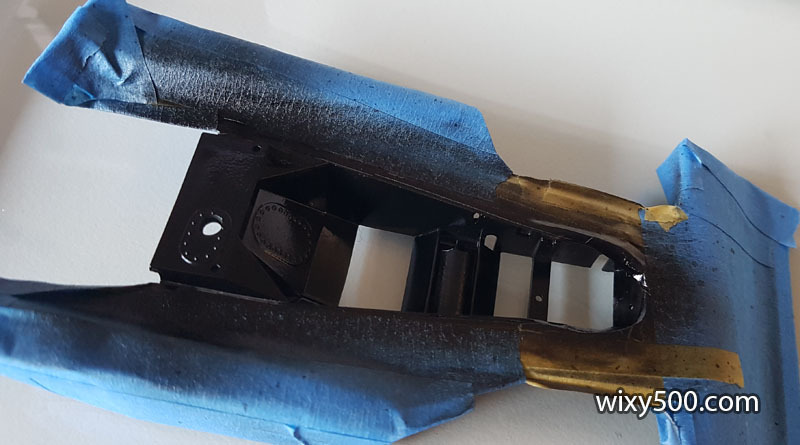 Rear wing main element after polishing. 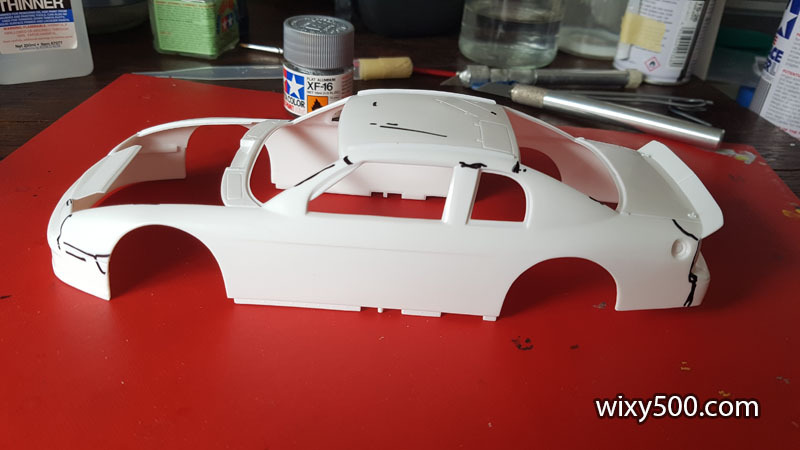 Masking the bodywork to spray the mononcoque aluminium. 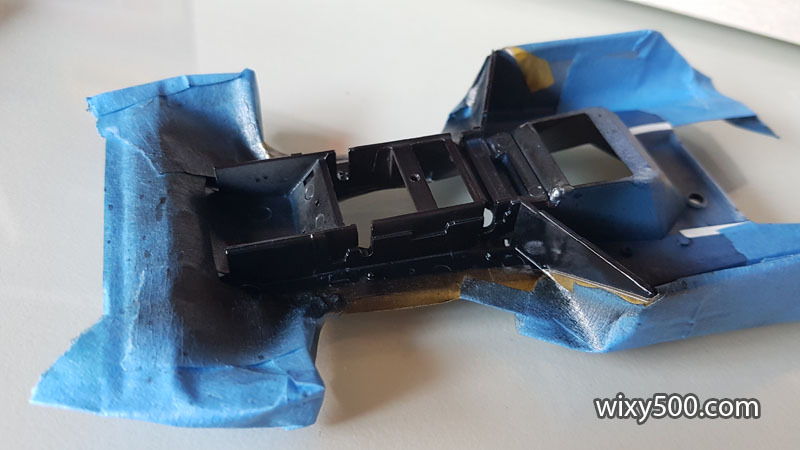 Going to try Alclad’s polished aluminum on this one, which requires a gloss black base. 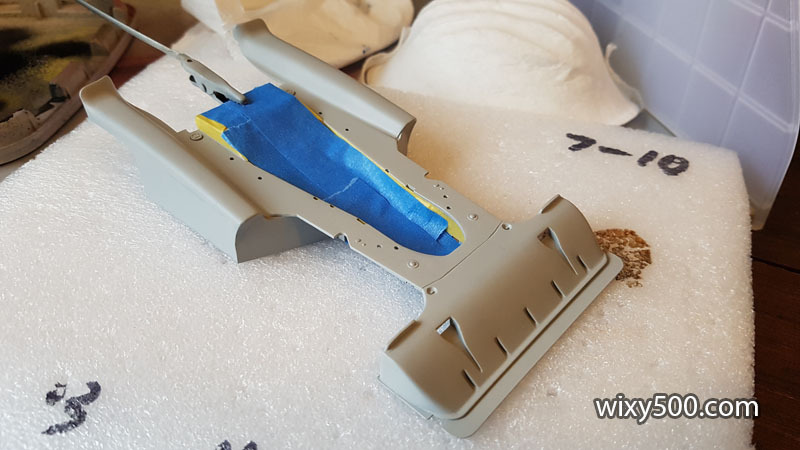 Parts of the underside will also be aluminium colour. Gloss black down, ready to polish. 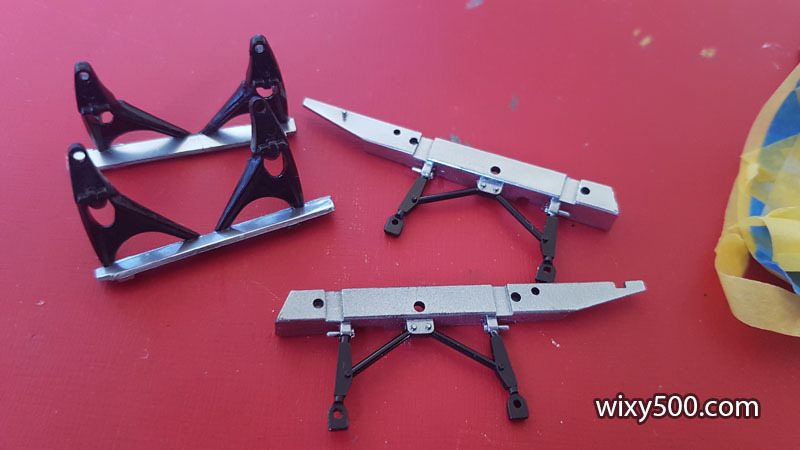 Masked suspension parts after they’d been hit with Alclad. 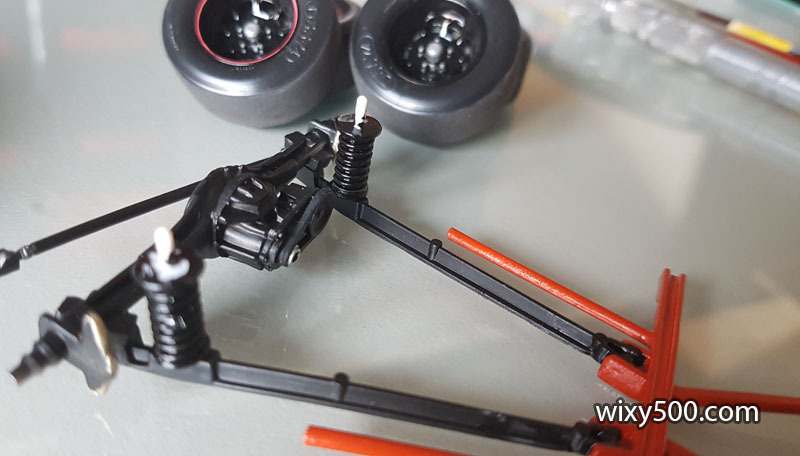 Masking removed from suspension components. A little touch-up/clean-up is required in a few places. After spraying the Alclad, the surface takes on a frosty appearance. 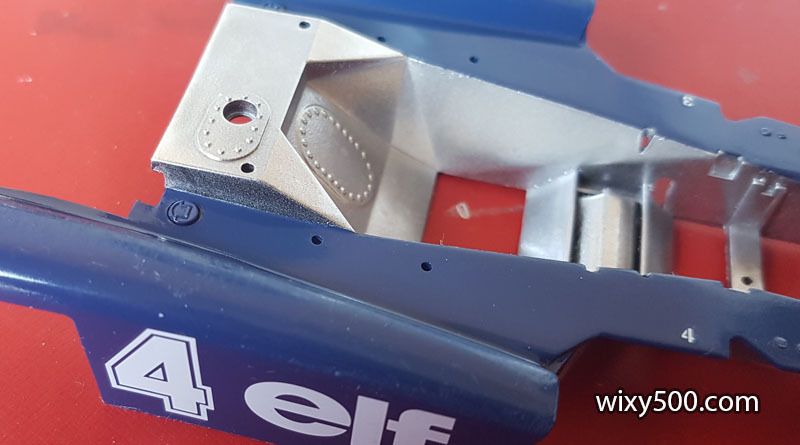 I’ll use a cotton bud to wipe that off, hopefully leaving a simulated polished aluminium finish! 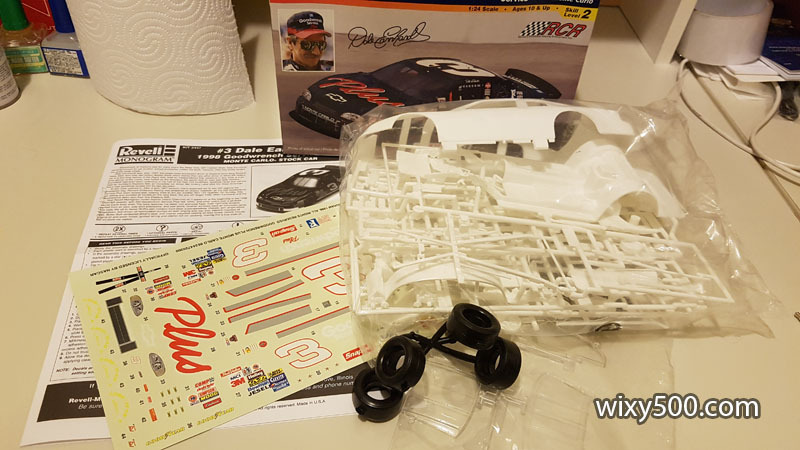 I’ve had this model jammed up the back of the kit stash for years, and after doing the recent ‘Quick Build’ of a Revell ‘Pro Finish’ NASCAR kit (see the Build diary HERE), thought it would be a good time to build a proper NASCAR stock car model. 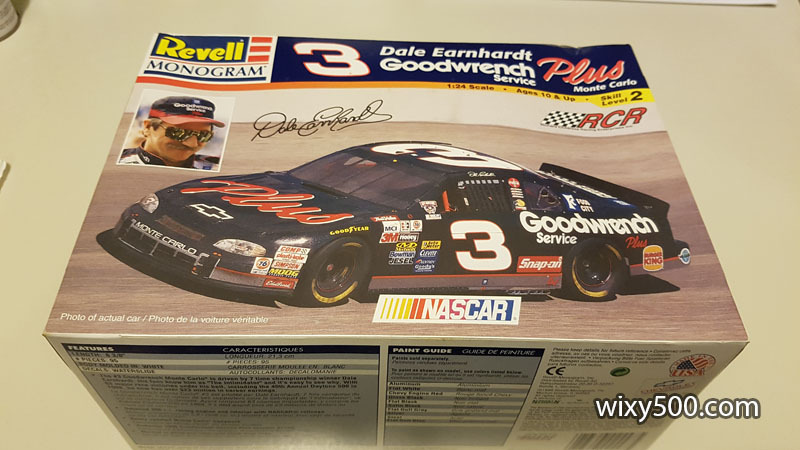 This Revell-Monogram kit depicts Dale Earnhardt’s Richard Childress Racing Goodwrench Chev Monte Carlo from the early season races of 1998, which includes that year’s Daytona 500 that Earnhardt famously won. 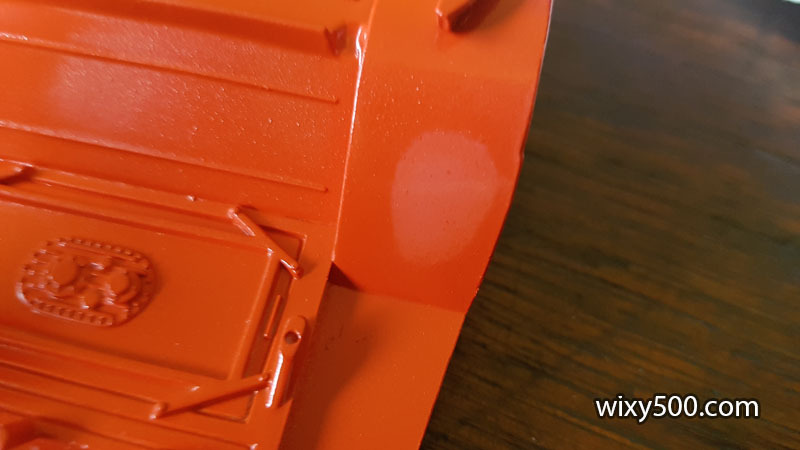 Not sure if this is just a bad example, or whether it’s typical of Revell-Monogram kits – there is a LOT of flash on parts and heavy mold lines. 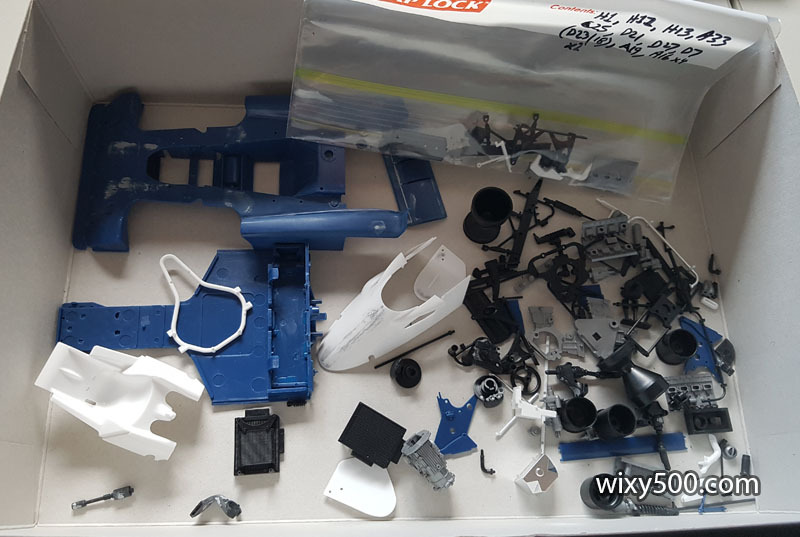 There’s a lot of work ahead to clean up every part in this kit. 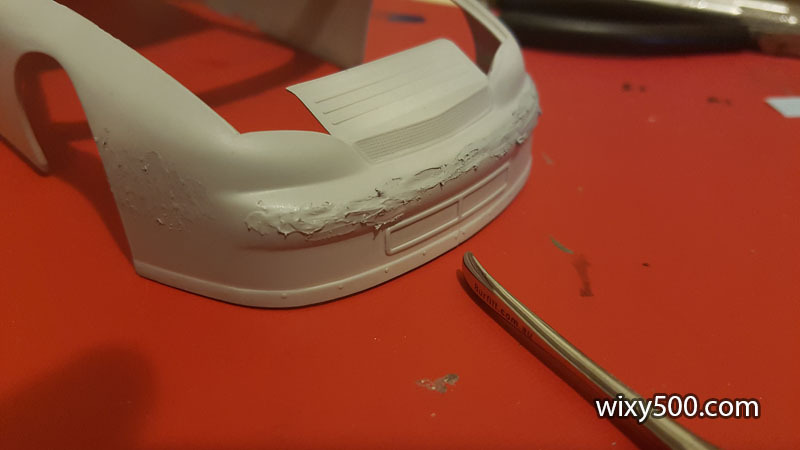 I use Tamiya putty for filling gaps and sink holes. Unfortunately it shrinks as it dries. 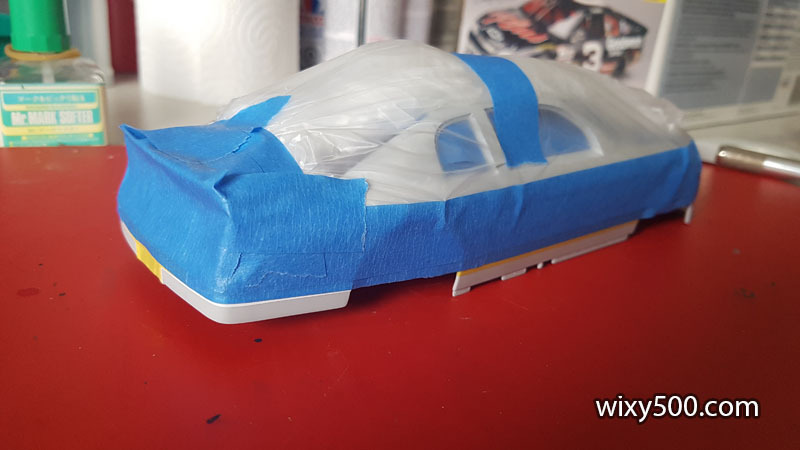 After initial putty and a hit of primer, it’s time for… more putty. Left: an original kit tyre. 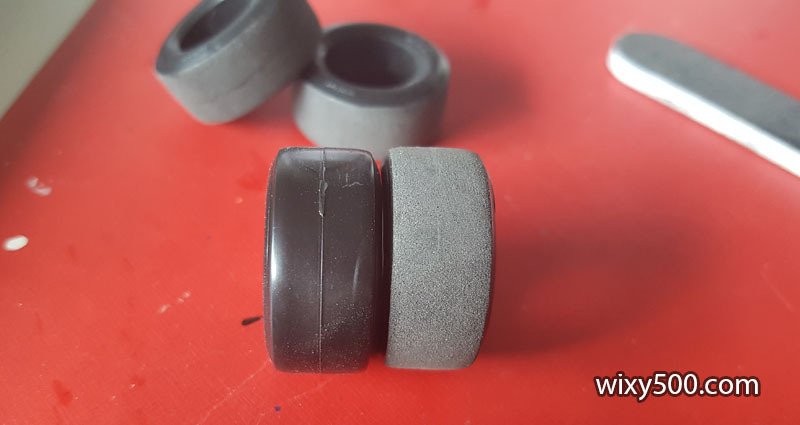 Right: Tyre with the tread sanded to remove mold marks and give a driven-on texture. 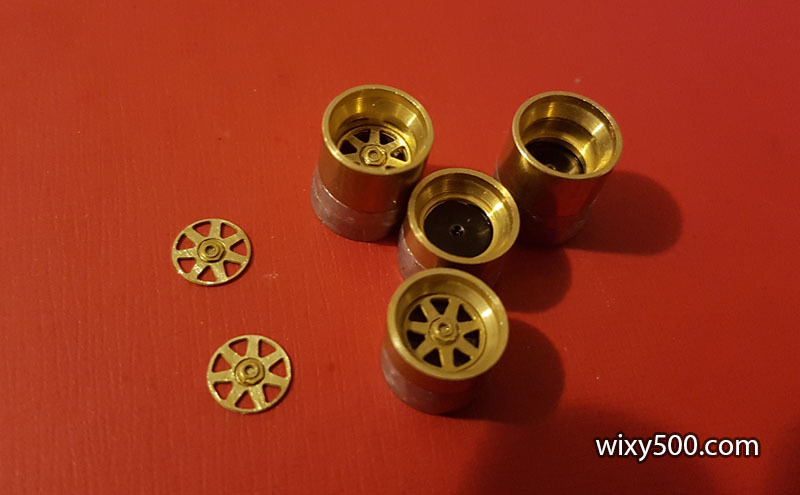 All the rims required the outer edge to be cleaned up. 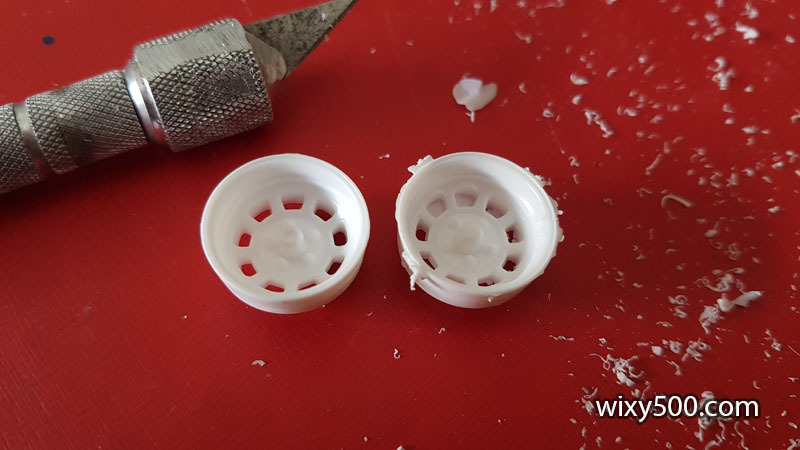 The wheel on the left has been prepped; the one on the right was the worst of the lot as many of the slots had to be cleaned and opened up as well. 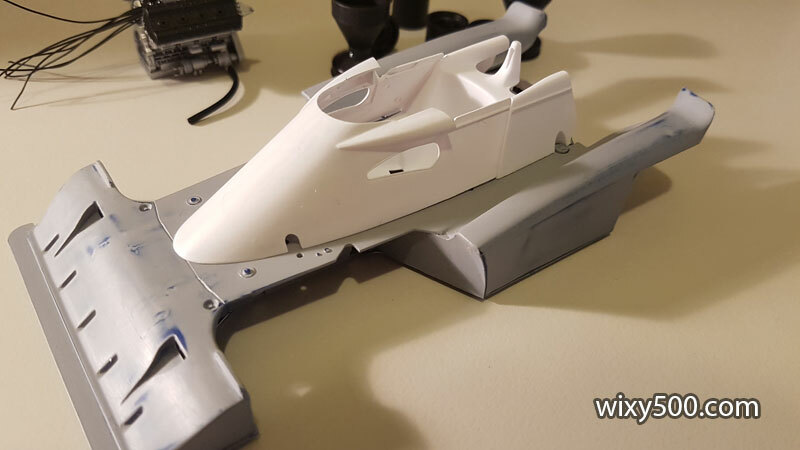 All parts are now prepped and the body/chassis/floorpan primed. The decal sheet includes the silver & red lower banner that runs around the bottom of the car. I’ve decided to spray the silver, then (hopefully) use just the red part as the separation. Masked and ready for silver. 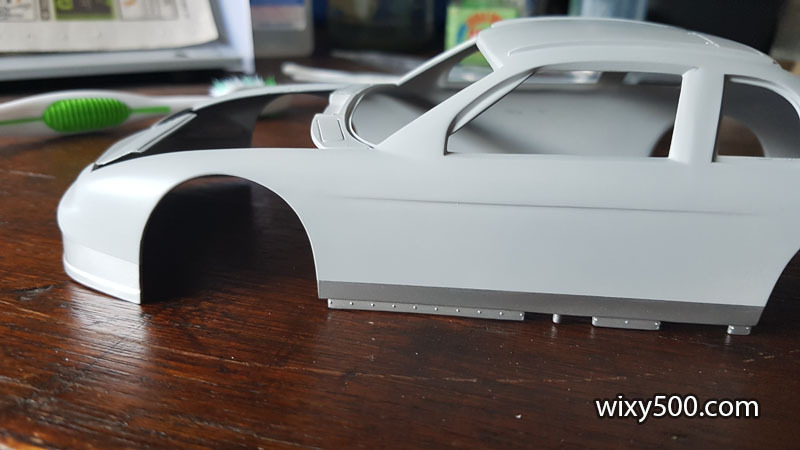 The silver was then masked ready for the gloss black body colour. 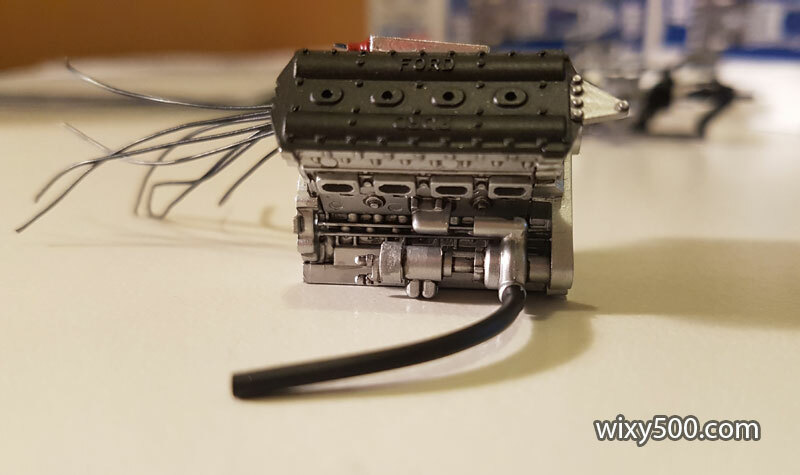 Basic engine in flat aluminium (oops, aluminum) colour. 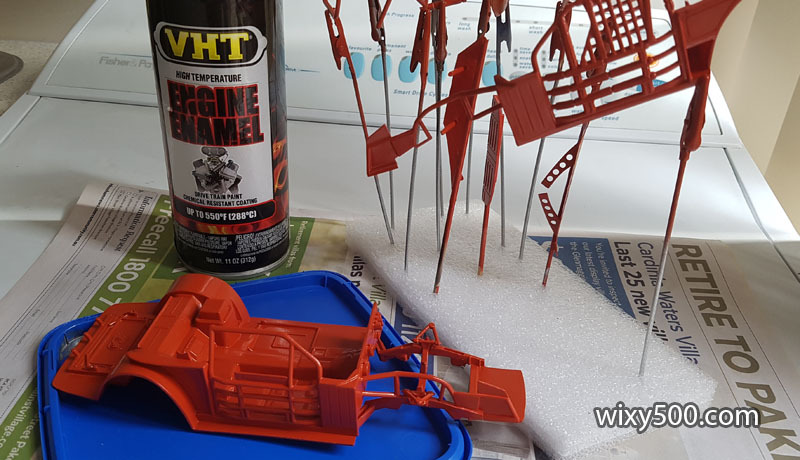 The instructions call for “Chevy Engine Red’ as the colour for the roll cage. It’s at this point I realise this model is most definitely not of the Daytona 500 winner. Earnhardt’s ‘500 win was at the wheel of a car with grey interior and very different grill mesh arrangement on the nose. 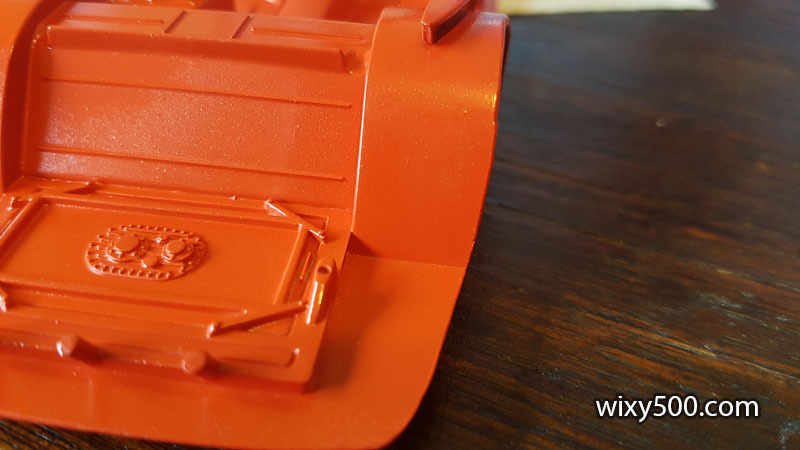 This kit’s box art depicts red interior, so I went with that. I found the colour at Autobarn and got lazy and used direct from the can. Big mistake! 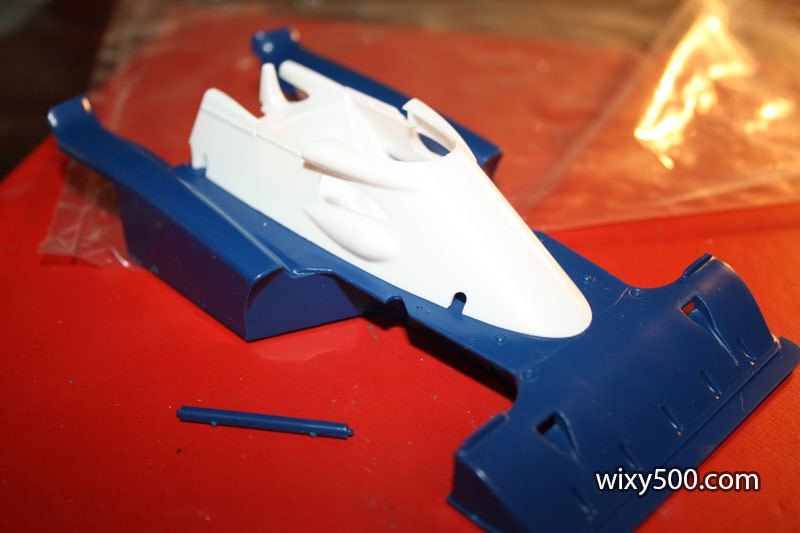 The spray is far less controlled and far heavier than a Tamiya TS rattle can. 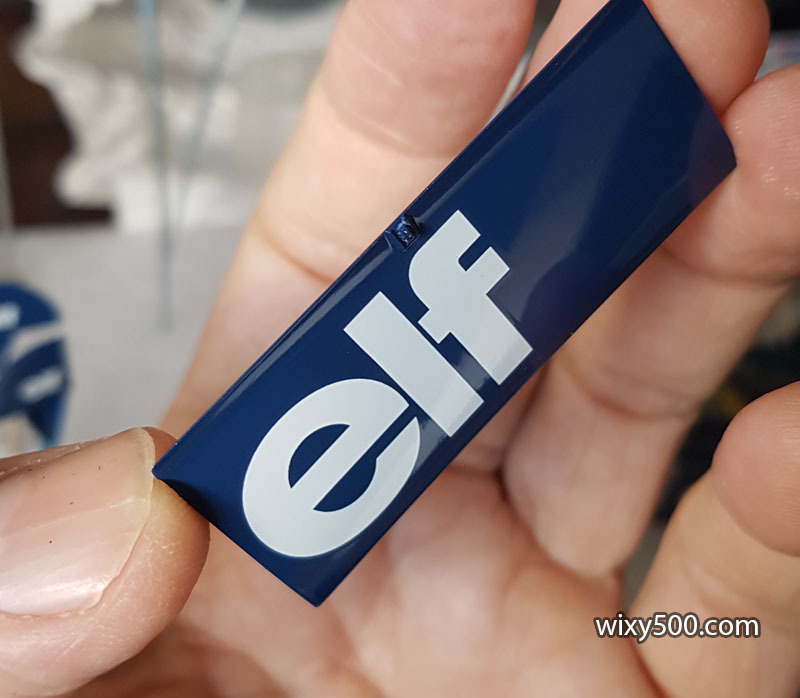 It was very hard to do light mist coats to get things started, but the initial coverage didn’t look too bad and was reasonably smooth and glossy while still wet. However, it looked far worse once dry. See the sandy look below. 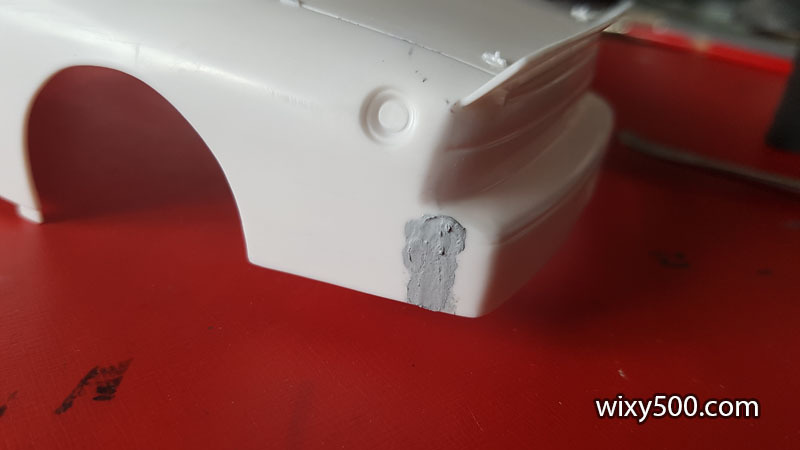 After (or during) drying, a weird ghostly residue formed on several areas for no obvious reason. 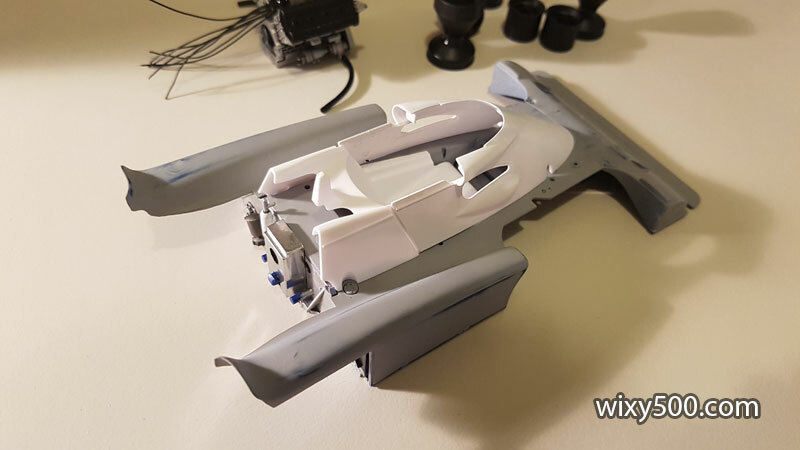 Progress on detailing parts and fitting out the chassis. 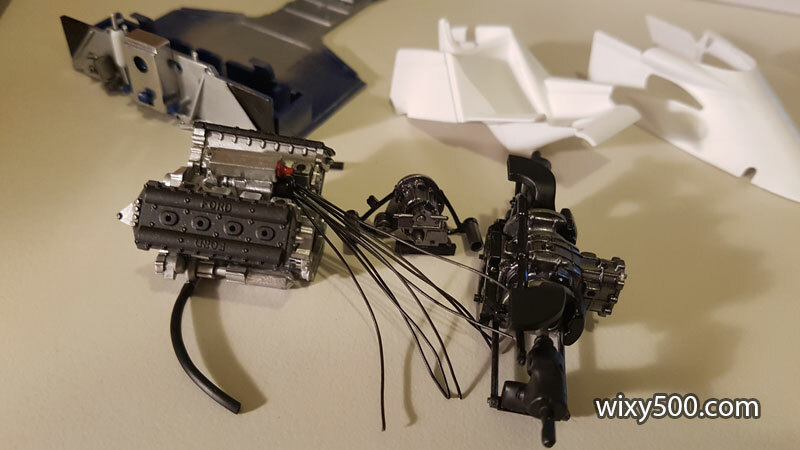 Engine is pretty much done. 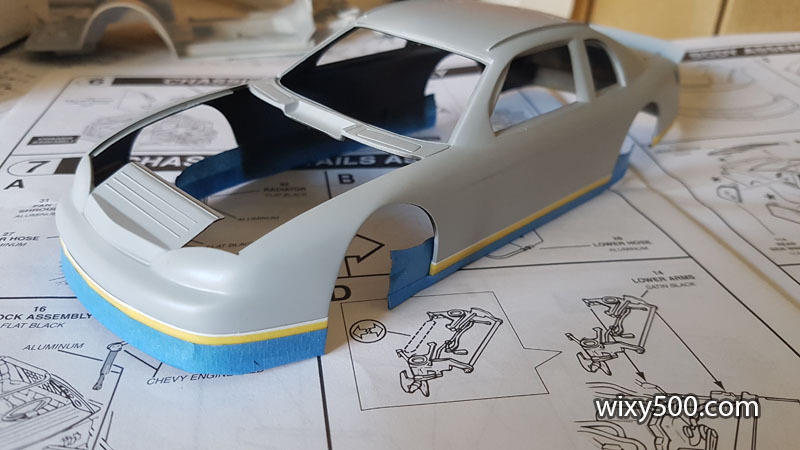 Main body has had it’s first coat. Roll cage starting to come together after the two main side pieces are fixed in place. 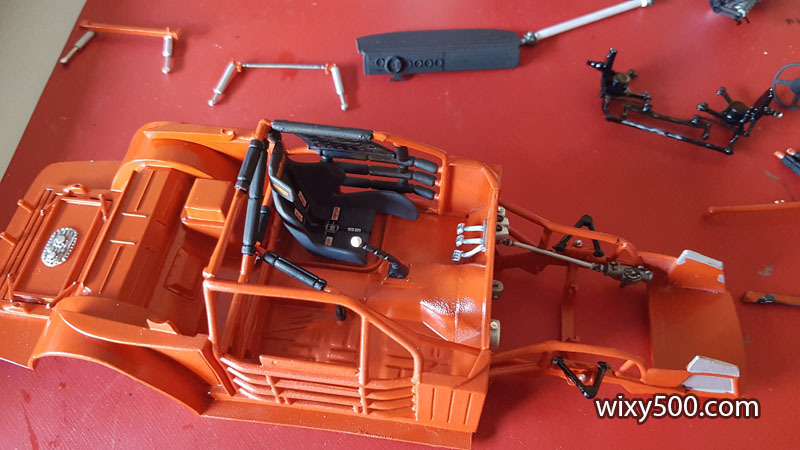 Interior parts have to be fitted before any more bar work gets in the way. 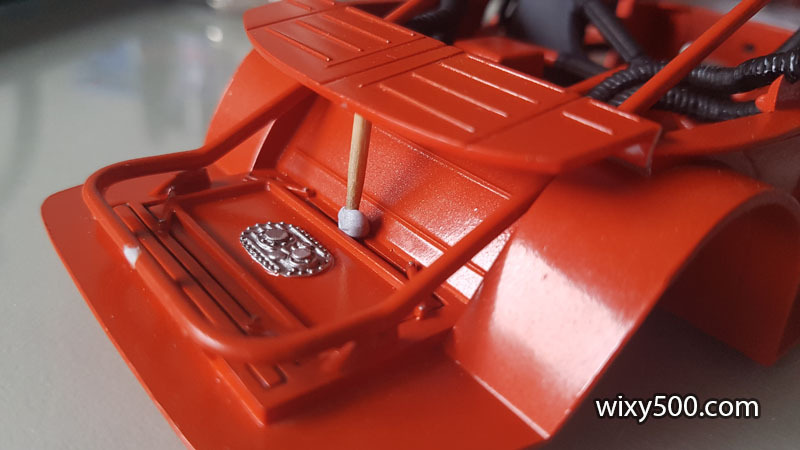 The real car has a fine red line around each rim edge, The kit does not include this, so I had a crack with a paint pen. It’s not too bad, but too thick for the scale. Wheel hub and lug nuts have been detailed by hand. 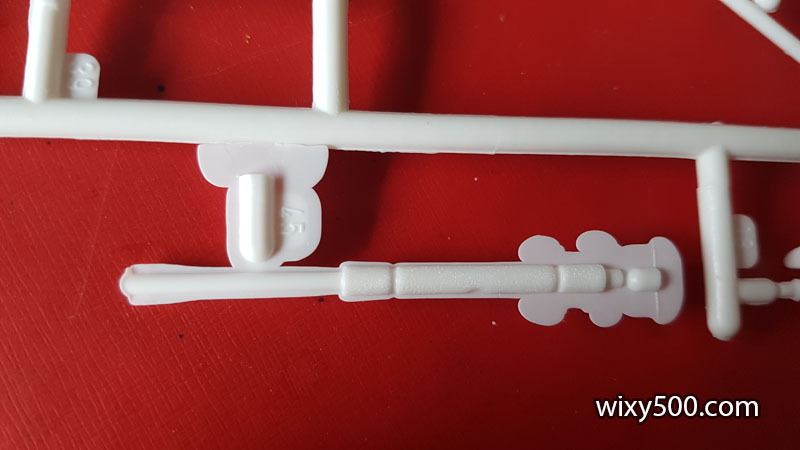 The kit does not include any method for locating the rear parcel shelf at the correct angle. 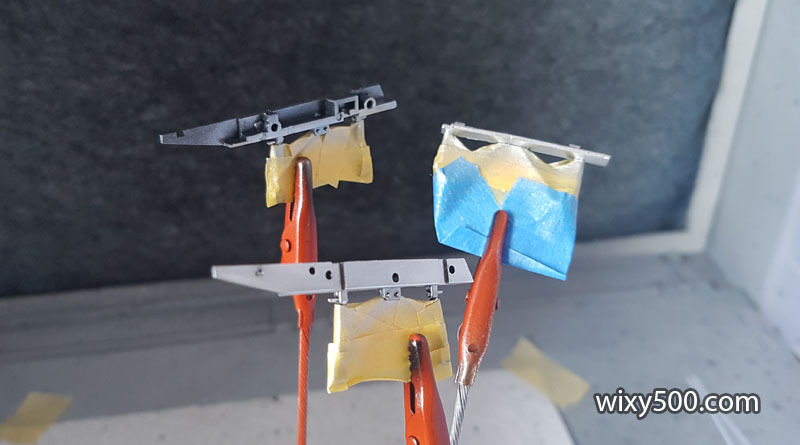 After lots of dry fitting with the body, I used a temporary brace to set the angle while the glue dried. These race cars have basic trailing arm rear suspension with coil springs as mandated by NASCAR. 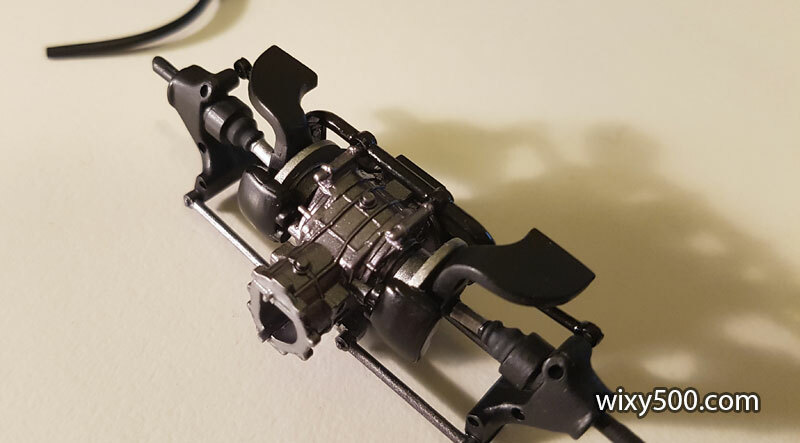 The kit includes belt-driven pump off the front of the diff. 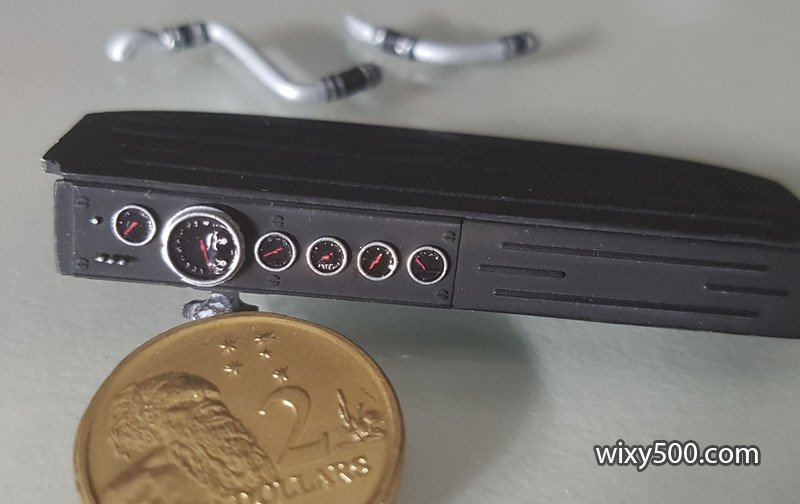 At least there’s one part of this kit I’m happy with – the dashboard! 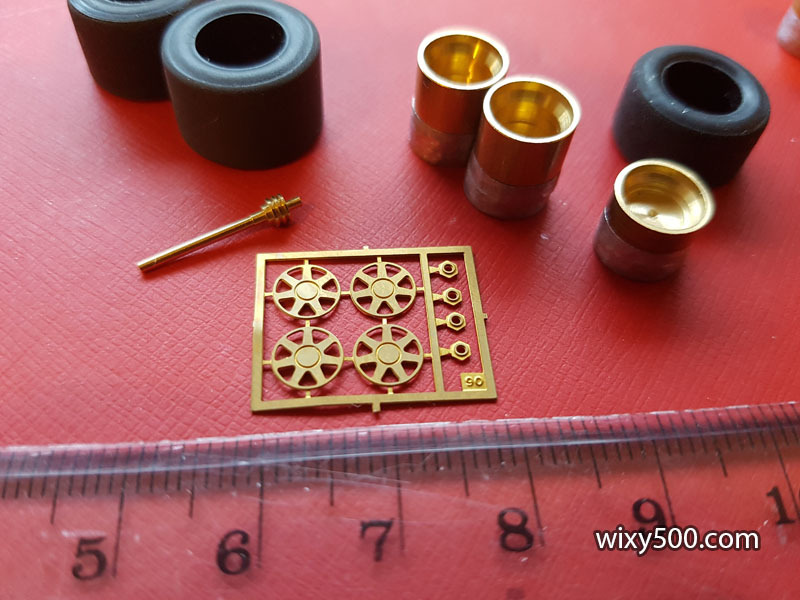 I used a really fine brush to pick out the needle, face markings and rim of each gauge (the detail is cast into the part), then used Kristal Klear for the lenses. $2 coin gives an idea of the size. Underside taking shape. 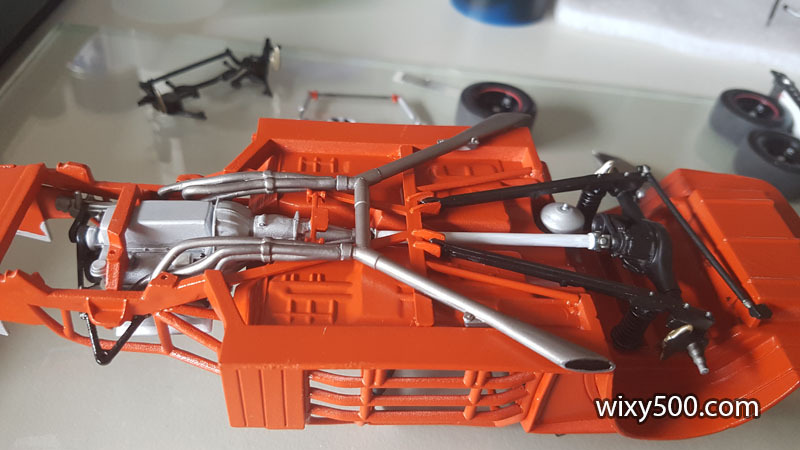 Once the rear end was in, I fitted the tailshaft, then the engine. 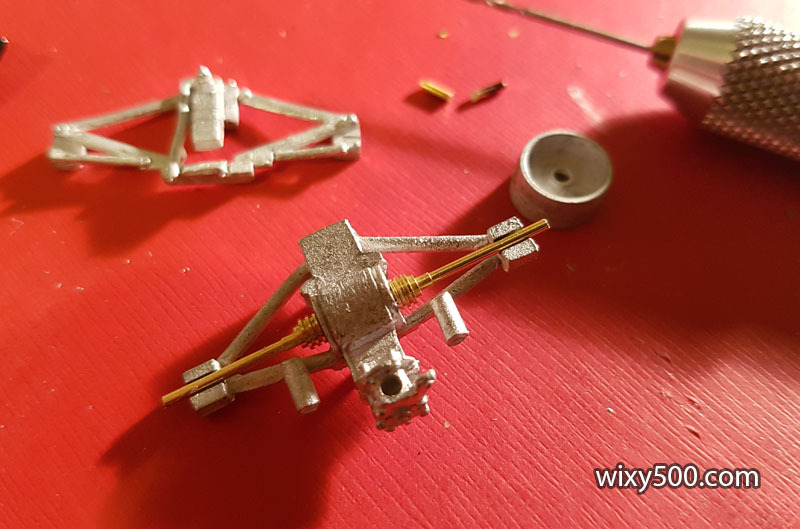 The instructions call for the tailshaft to go in last, but that would have been impossible because, with a mounting pin at each end, it’s longer than the available space! Revell-Monogram label this a ‘Level 2’ kit, but if a novice builder just followed the instructions, they’d get this messed up. I bought this Tameo kit from a shop in Adelaide in the late 1990s. 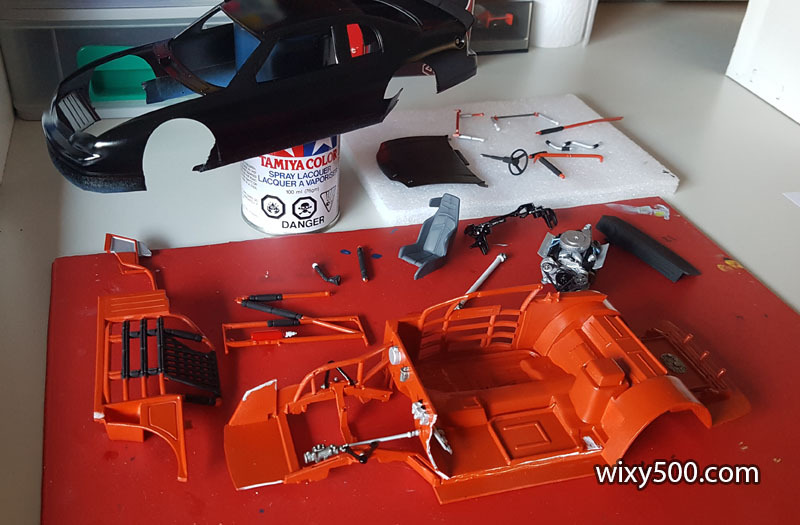 The previous owner had made a start, painting the body and floor, plus assembling the front and rear wings. They’ve done a decent job of the body, but there are numerous other parts that should be the same colour. 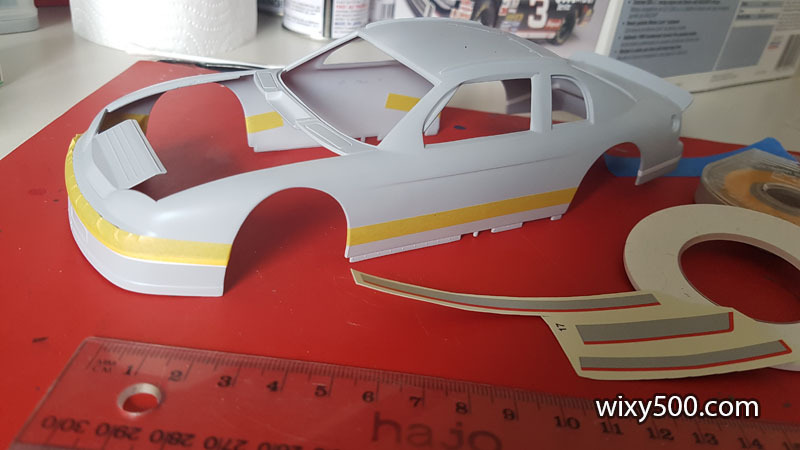 I’m going to have to try and find the right yellow to match, or perhaps strip the existing work and re-spray to get a uniform look. 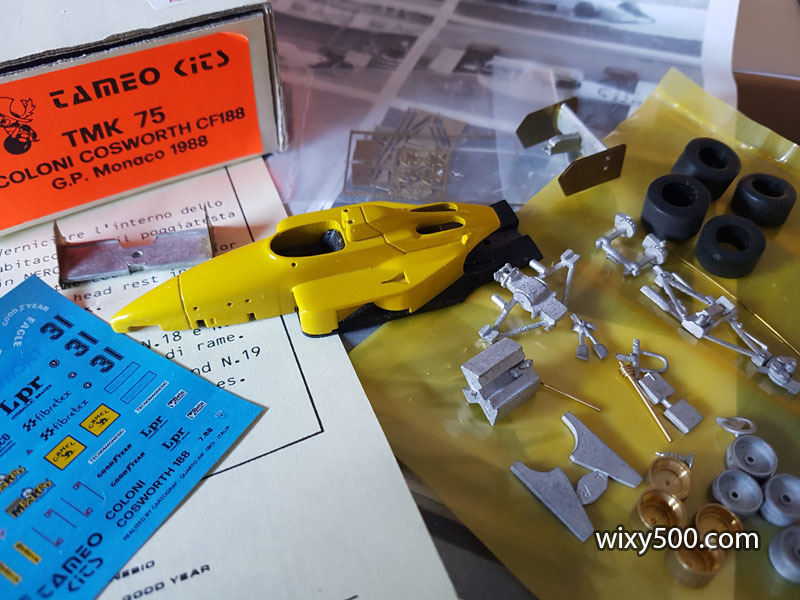 Tameo kit #75 has been started by someone else. Will be finished by me. Each rim is two pieces and then requires photo-etched spokes and wheel nut to be glued in place. 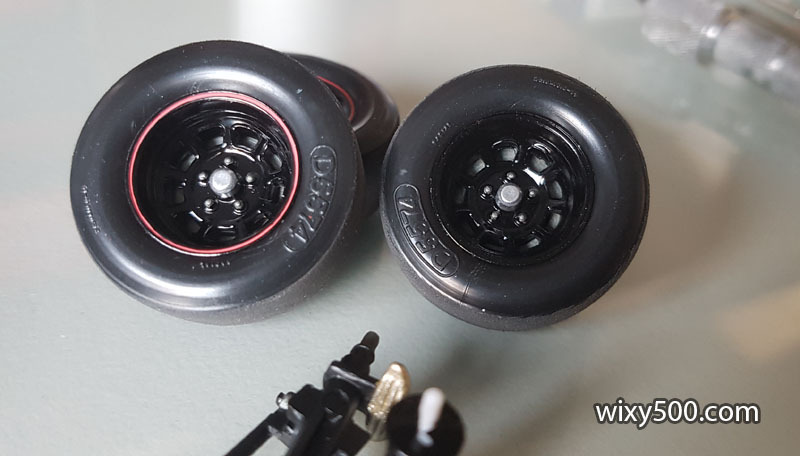 Wheels nuts are about 2mm wide… Tyres have had the edges lightly sanded. Fitting the spokes inside the rims, which have had some black paint added. Each wheel will be sprayed semi-gloss black.